The chinese company DJI is the world’s leading consumer drone manufacturer selling quality drones with sophisticated technology for a good price. Widely popular among drone enthusiasts, it has a range of products catering to the aerial photography market that includes drones, accessories and some special controllers. 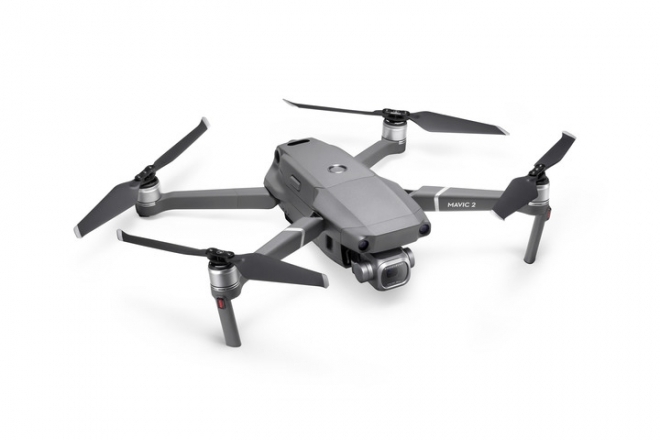 DJI Mavic 2 Pro, one of their latest products, is a top-of-the-line drone built with some advanced tech and loaded with impressive features. Here is a detailed look at this amazing drone and what it has on offer. A quick glance at The DJI Mavic 2 Pro and you’ll notice that it is not a far cry from its predecessor. Both the models come in a sleek and lightweight design: well contoured body with four solid fold-out arms, camera fitted up front and a battery pack in the rear. But a closer look reveals the key differences. The Mavic 2 Pro comes with a slightly bigger camera and more sensors mainly for avoiding obstacles- everything in a much more compact package for a faster and quieter flight. It measures 91*84*214 mm and weighs just about 300 gms when fully folded down, meaning it easily fits into a small carry bag. It comes with 8GB of internal storage with space for a microSD slot which can take cards up to a whopping 128 GB. There’s also a USB type C port that enables you to hook the device to a computer or phone for downloading firmware updates. For it to fly the DJI drone needs an Android or iOS device running the DJI Go app, which is also useful for downloading firmware updates onto the drone and controller. The app works seamlessly with the OcuSync2.0 digital video transmission system, giving you crisp and stable pictures of the live feed in hi definition. As a drone enthusiast, you know how nervous it gets with those close calls with trees and billboards. Again, it’s never fun to watch your high-flying drone crash into the ground with a loud thud. But you don’t have to bother much with the Mavic Pro 2. Obstacle avoidance is as good as it gets, with sensors on all six sides and a downward-facing light to prevent you from crashing. And that means the drone will maneuver around obstacles, and you can keep it flying in the air and out of the ‘drone fails’ listings on Youtube. The flight time per charge is quite impressive at 31 minutes. It’s certainly not out of the league compared to the competitors, but the drone makes you feel a little relaxed by flying for a little extra time. Capable of taking 20 MP images and videos in 4k, the Hasselblad camera doesn’t disappoint; it keeps cranking out crisp pictures with great quality and performs reliably even when the light dims thanks to a one-inch sensor size. Its adjustable aperture ensures that the images taken in a bright setting aren’t too saturated, which basically mars the details of the images. In addition to improved image quality and low-light performance, the dynamic range and color depth is remarkably good, resulting in high quality still shots and amazing video footage. Overall, it’s plain fun to fly, easy to control, less noisy when humming and loaded with advanced tech, making it a lot easier to maneuver the drone into desired positions for capturing cool aerial shots in high resolution without drawing anybody’s attention. If you’re in Canada and are looking to buy Mavic 2 online from a reputed seller that knows a thing or two about consumer drones, head on over to https://omniviewtech.ca/collections/mavic-2/products/mavic-2-pro. You’ll be glad you did.